When you post to your networks or schedule posts to go out, you are able to see exactly what has been dispatched, what is in the queue, and what has failed to send. To access the Dashboard, select 'Your Posts' from the grey toolbar. These are the posts that have been sent out to your networks. These are the posts that are scheduled and awaiting sending. Any posts that have failed to send are shown here. Here you can look at the Send Date, Campaign Name, and Click information. Here you have the option to 'Delete' a post. You are able to click on the URL in your posts to check all is working as expected. Please Note: If you delete a post in the dispatched list this DOES NOT remove it from your social networks, just from your dispatched list. Please Note: If you have posts that have failed, please contact our Support Team on support@communigator.co.uk. 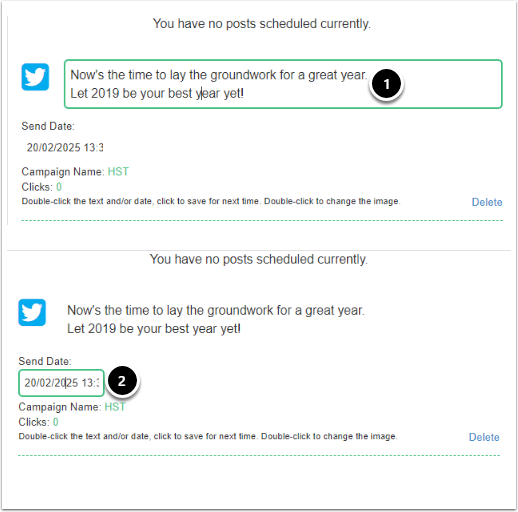 You are able to edit the content of scheduled posts in the dashboard. Double click into the post text. A green box will appear around the post, showing that you are editing content. You can also do this for the date and time of the post.